Malcolm Comments: Lookin’ cool with her fairy devil-pig and her giant Master Lock. Wasn’t Podkayne, like, 14, and not a giant-eyed slutty-dressed suitable-for-Instagram-stardom? I don’t recall the long bleach blonde hair either. I’m also giving whoever was responsible for the cover text a side-eye for two reasons: the “groovy” font, and calling Heinlein “the master of fantasy”, when he mostly wrote science fiction his whole career. Especially up to the point of this printing (it took 6 years to be published in Britain? ), and this one in particular being SF. And the misleading Wreath of Approval, implying that this book won the Hugo. I do not grok this cover. @Bruce A Munro, gotta say, the hi-top Chucks do kind of give the whole assemblage a certain timelessness, from the perspective of 50 years later. Another sad victim of Martian teenager belly-button frostbite. 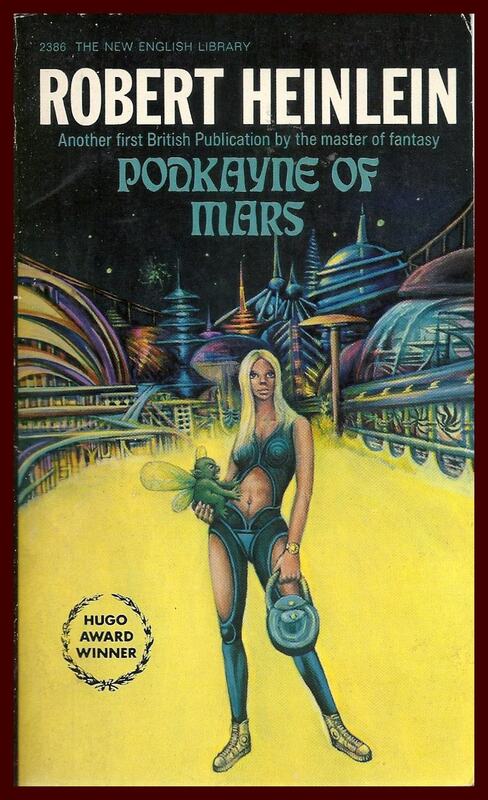 I kind of wish there was a Pod-Kanye of Mars book. The cover model’s clothing would be equally bad, but a completely different aesthetic than this one. She’s waiting for Floyd, Animal and Dr Teeth to show up. @THX: he took the photo. That’s why he needs sunglasses now. @GSS ex-noob: if the Wikipedia article is correct, the book wasn’t even nominated. But if it’s Venus, they couldn’t see the stars, let alone what seems to be a spiral nebula. Science fiction-y! The little imp she’s carrying is being way too aggressive about suckling at her breast. At least she has sensible footwear – many damsels on skiffy covers don’t even get a pair of shoes! @Bruce: If you can see bright stars and giant spiral nebulas on Venus in this reality, it can also be made of artificially-colored banana pudding. Although the glow/texture/opacity makes me wonder if it’s either lemon jello or lemon meringue pie filling. Her Chucks might not have been that color originally. @Tat: I KNEW she reminded me of someone, and you’ve nailed it. Fer shure. I think the little Venusian critter may be the most accurately-depicted thing on the cover, though I don’t recall its color. @Tag: do we have a “she’s got legs” tag? Because, she does, and she’s showing them off. @Tag: Not to mention, ‘so much yellow’.